(Nanowerk News) Scientists at École polytechnique fédérale de Lausanne (EPFL) have used a new imaging technique to monitor how glucose, our main energy source, is used in the body. Their findings may have great implications for diseases like diabetes. Glucose is essential for the production of energy in our bodies, and its level in the blood must be maintained carefully, especially in sensitive organs like the brain. In our cells, glucose is stored in a molecule called glycogen. But despite the importance of glycogen in disorders like diabetes and hypoglycemia, its distribution and metabolism in the body has remained elusive. Using a novel imaging technology called NanoSIMS – previously used for example on meteorite samples – scientists at EPFL have been able to trace how glycogen is used in cells of the liver and the brain. Their work is being published in Nanomedicine ("Imaging liver and brain glycogen metabolism at the nanometer scale"). 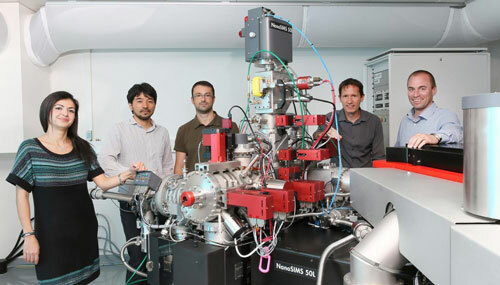 The researchers with the NanoSIMS apparatus. Understanding how cells store, distribute and metabolize glycogen is central to the treatment of associated disorders like diabetes and hypoglycemia, both of which are characterized by a decreased breakdown of glycogen, resulting in less glucose being released in the blood and subsequent energy loss. Glycogen depletion also causes a common phenomenon called “hitting the wall” in long-distance athletes like marathon runners, cross-country skiers, and cyclists. Despite being of central importance to the proper function of our bodies, the distribution of glycogen over time is still unclear. One of the reasons is that the usual imaging technique used to trace it, magnetic resonance imaging or MRI, does not have the necessary sensitivity to achieve the required spatial resolution to image glycogen inside individual cells. Led by Arnaud Comment and Anders Meibom at EPFL, in a collaboration that includes colleagues from EPFL and UNIL, the scientists have used a new imaging technology to successfully trace the evolution of glycogen in the liver and brain of mice over time. NanoSIMS (SIMS stands for Secondary Ion Mass Spectrometry) is an ion microprobe that bombards a solid sample with a beam of “heavy” particles, such as cesium atoms. The bombardment forces ions from the sample to be ejected, and they are then identified with a mass spectrometer. The readout from individual ions is then used to identify the chemical components of the sample. The researchers used NanoSIMS on liver and brain tissue samples, which had previously been enriched with a type of glucose that can be traced in imaging. However, NanoSIMs images appear as colors and lines, and are not sufficient to localize molecules in a cell. For this reason, the samples were also photographed with an electron microscope, which provided an actual image of the tissue and cells. The team then superimposed the NanoSIMS image over the real photograph from the electron microscope, and could then obtain a complete picture of glycogen distribution in liver and brain cells. Using this method at different time intervals, the researchers were able to track the how glycogen is formed over time, and in which parts of the cells. Their findings showed that liver cells store glucose into glycogen almost 25 times faster than brain cells (astrocytes). “This is the first time that this phenomenon is measured at such a small scale,” says Comment. The method can be used for tracking other biological molecules, such as neurotransmitters in the brain. This is something that Comment’s team is planning to do next, aiming to use their novel approach to achieve high-resolution imaging of how signaling molecules are distributed and metabolized in different parts of the brain. The team is also working on improving the precision and accuracy of detection by combining it with fluorescence imaging.